Basophils are a specific type of white blood cell. These cells are readily stained with basic dyes (this is where the name comes from). 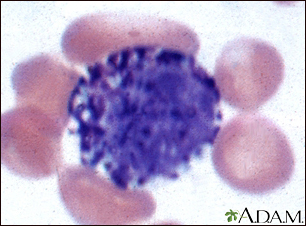 Note the dark grains inside the cellular fluid (cytoplasm) of this basophil. Basophils make up only a small portion of the number of white blood cells but are important parts of the body's immune response. They release histamine and other chemicals that act on the blood vessels when the immune response is triggered.